When cooking an expensive steak, you want to make sure you cook it right. With What’s Cooking America’s step-by-step cooking instructions, you will learn how to cook perfect steaks every time! You will not only learn how to cook the perfect steak but also how to purchase and prepare the steaks. We’ll walk you through methods for pan-seared in a cast-iron skillet, sear-roasted in the oven or grilled on the barbecue. The most important tip I have learned over the years is that using dry heat is the best way to cook perfect steaks and other tender cuts of meat. Dry heat cooking causes the exterior of the meat to brown and caramelize which gives the steaks a richly browned complex flavor. This is partly a result of the sugars inherent in the meat going through a series of complex reactions called the “Maillard reaction.” The moisture on the surface of the meat also evaporates and the juices become concentrated, forming the appealing brown crust. When buying steaks, buy the best grade of meat you can afford. It should be USDA Prime Aged Beef. If your butcher does not have this, the next best grade is USDA Choice. Look for steak with fine texture and firm to the touch. You want the color to be a light cherry red color (not deep red). Also look for steaks that have marbling, as it is the thin threads of fat running through the meat that make it prime and gives the wonderful flavor. Marbling is the white fat that you see in all cuts of beef. Remember that a substantial amount of evenly distributed marbling is a good thing. Look for small, evenly distributed specks of fat rather than larger and sparser ones. Marbling are the fine specks of fat within the meat. While studies show that marbling does not significantly increase the caloric count of beef, it greatly enhances flavor and tenderness. Beef that is richly marbled gets a higher grade as it is more tender, juicy, and flavorful because the intramuscular fat melts and bastes the flesh during cooking. Also, since fat insulates, marbling provides some insurance against overcooking. If you don’t want much animal fat in your diet, then don’t eat steak! To avoid fat in steak is to avoid steak altogether! Size or thickness matters when purchasing steaks. The best steaks are 1-inch to 1 1/2-inches thick. A thin cut is likely to get dried out. The thickness of the steak is more important than the weight. The USDA’s grading system gives a good way to assess quality. The grading designations are largely determined by the amount of visible fat that’s streaked throughout the muscle tissue, called marbling. Prime Beef: The highest grade in the United States meat grading system. 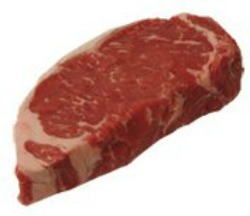 USDA Prime Beef has has an abundant amount of marbling (the network of fine lines of white fat). This marbling, as well as other factors such as feed quality, and aging, adds to the rich flavor and fine texture of the best cuts. Prime beef is most commonly sold in fine restaurants, specialty meat markets and is exported to upscale restaurants in foreign countries. Choice Beef: USDA Choice is the next best grade of beef. Choice has less marbling than Prime but more than Select. Select can be somewhat more tough in texture and can dry out more easily when overcooked, especially as steaks. Choice beef is typically found in the service meat case at your local grocery store. Select Beef: Select has the least amount of marbling of the top three grades, making it leaner but possibly less tender, juicy or flavorful than Prime or Choice. Select is most commonly found in the self-service meat case at your local grocery store. Not recommended for top-quality steaks. Do not salt your steaks just before cooking. I know that some people do salt their steaks before cooking, but trust me and don’t salt – the result will be juicy, delicious steaks to serve your family and guests! Salt after the steak is cooked to your liking, has rested the required time, and just before serving. Salt brings moisture (water) to the surface of the steak, and the water sits on the surface as you cook the steak. Thus, you are again basically steaming the steak. Traditionally, when browning meat, chefs skip the addition of salt because the salt draws water out of the meat’s surface through osmosis. If, for example, you were to season a steak just 10 minutes before grilling, beads of moisture would appear on the surface, eventually forming a shallow puddle of juices. On the grill, the steak would turn gray, not brown. Meat cells brown at around 310 degrees F. Water on a steak’s surface boils and turns to steam at 212 degrees F, so a wet steak can turn gray and cook through before its surface can brown. Exception to the Rule – Steak Salt Curing Method: This salt curing method can make a choice cut of steak taste like prime steak. Use coarse, kosher, or sea salt only (not fine table salt). Use 1-inch steaks or thicker. Cover both sides of your steak generously with salt. Let sit at room temperature for one (1) hour. If using thinner or thicker steaks, modify the time accordingly. Rinse off all the salt with water and then pat the steaks completely dry with paper towels. Cook the steak to you liking. What constitutes rare and medium-rare cooked meat? To satisfy government home economists, the Beef Council says rare beef means an internal temperature of 140 degrees F. Well, that is ok if you like well-done and dry meat. If you like moist, rosy meat (like I do), rare begins when the internal temperature registers 120 degrees F. and starts to become medium rare at 125 or 130 degrees F. To cook your meat properly, you must purchase and use a good instant-read digital meat thermometer. 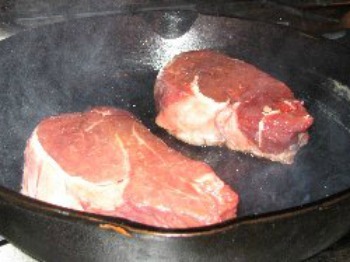 Residual Heat or Carry-Over Cooking: Remember, the steak will continue to cook as it sets. The temperature will rise to 125 degrees F. to 130 degrees F. internal temperature (medium rare) at 15 to 20 minutes. So, pay attention to how long you let the cooked steak sit before serving! Residual Heat Definition: Carry-over cooking is caused by residual heat transferring from the hotter exterior of the meat to the cooler center. As a general rule, the larger and thicker the cut of meat, and the higher the cooking temperature, the more residual heat will be in the meat, and the more the internal temperature will rise during resting due to carry-over cooking. This means the meat must be removed from the heat at an internal temperature lower than your desired final internal temperature, allowing the residual heat to finish the cooking. 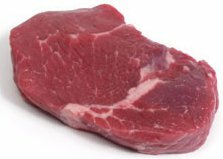 Room Temperature Steaks: Always let your steaks come to room temperature (70 degree F.) before cooking or grilling. If your room's temperature differs from 70 degrees F., then just adjust your time accordingly. A cold steak will contract when it hits the heat and this wall cause it to toughen. This is possibly the first biggest mistake people make. Remove your steaks from the refrigerator at least 30 minutes before you plant to cook them - sometimes as long as 60 minutes (depending on size). Pat the steaks dry with a paper towel. You want to have a completely dry steak before cooking. If you steak is wet, you will essentially be steaming it! In a heavy frying pan (I use my cast-iron skillet) over medium-high heat, heat 2 tablespoons olive oil. Rare - 120 degrees F.
When the steaks are crusty-charred and done to your liking, remove from the cast-iron pan, cover loosely with aluminum foil and let rest 5 to 10 minutes before serving. During this time the meat continues to cook (meat temperature will rise 5 to 10 degrees after it is removed from the oven) and the juices redistribute (add juices that accumulate from resting steaks to any sauce you are making). Serve whole or slice thin and fan onto individual serving plates. Preheat oven to 500 degrees F. (a very hot oven produces a juicy interior). Place a 10- to 12-inch ovenproof skillet or cast-iron skillet and place on range over high heat (the pan and the handle will be extremely hot - be careful). Immediately place steaks in the middle of hot, dry cast-iron pan (if cooking more than one piece of meat, add the pieces carefully so that they are not touching each other). Cook 1 to 2 minutes without moving; turn with tongs and cook another 1 to 2 minutes. When the steaks are crusty-charred and done to your liking, remove from the cast-iron skillet, cover loosely with aluminum foil and let rest 5 to 10 minutes before serving. During this time the meat continues to cook (meat temperature will rise 5 to 10 degrees after it is removed from the oven) and the juices redistribute (add juices that accumulate from resting steaks to your wine sauce). Serve whole or slice thin and fan onto individual serving plates. Using dry heat from a grill (barbecue) is another great way to cook quality steaks. Remove steaks from refrigeration 1 hour before cooking and wipe any excess marinade (if used) off the steaks. When you are ready to grill, preheat Barbecue Grill and coat your grill with non-stick kitchen spray before you begin to keep your steaks from sticking to the grill. Place steaks onto hot grill. Only flip the steak once. Let it cook on one side, then let it finish on the other side. Grill to the desired degree of doneness, about 3 to 4 minutes on each side for medium rare. Use a meat thermometer to test for doneness. When the steaks are crusty-charred and done to your liking, remove from the grill and let sit 15 minutes before serving (meat temperature will rise 5 to 10 degrees after it is removed from the oven). Choosing the correct cut of meat is very important when grilling. Some of the best steaks for grilling are the premium cuts. Thickness of the steak is very important. Each cut should be between 1 inch and 1 inches thick. The strip steaks and top sirloin should be a little less expensive than the filet mignon, t-bone, porterhouse, and rib eye. Photos from Hormel Foods and CSU Meat Sciences. 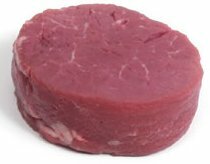 Filet Mignon – The filet mignon is a stylish cut taken from the heart of the beef tenderloin that has outstanding taste as well as texture. They are the most tender steaks you can buy, though not the most flavorful. New York Strip – The New York strip is such an excellent cut for grilling, many grilling experts refer to it as the “ultimate” steak for cooking out. Porterhouse – The Porterhouse is a very large steak that is actually a combination of two steaks: the New York strip on one side and a tender filet on the other. Many believe these to be the best of all steaks. 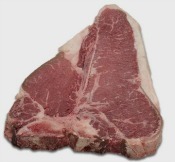 T-Bone – Named for its distinguishing T-shaped bone, this choice cut is almost identical to a Porterhouse steak, only it does not have as much of the tenderloin muscle in it. 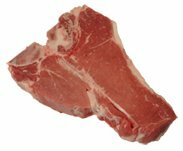 The T-bone steak is a succulent cut that is a favorite of steak fans. It is both a strip sirloin (with the bone) and a tender filet mignon. Rib Eye – Another classic cut, the rib eye has marbling throughout the meat – making it one of the juiciest cuts as well as very tender. Top Sirloin – The sirloin is near the rump, so the meat’s a bit tougher than cuts from the loin or the rib. The top sirloin is a juicy cut taken from the center of the sirloin – the most tender part – and a great cut for grilling. 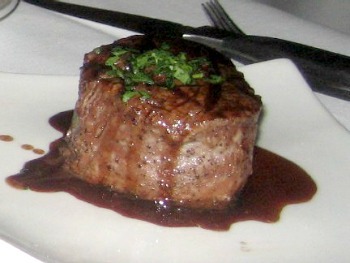 Filet Fraud – Don’t be fooled! Also known as mock tender steak, fish steak, chuck fillet steak, chuck tender steak, shoulder petite tender. Some less-than-honorable butchers and restaurants serve and sell cheaper cuts of meat that they masquerade as expensive filet mignon. 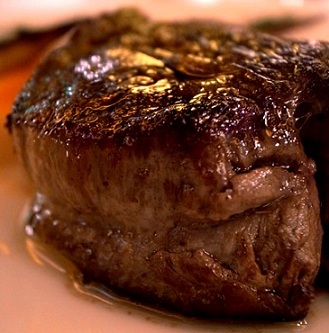 Real filet has a very fine grain and a buttery texture with no connective tissue. The chuck tender has more marbling and noticeable connective tissues. In other words, it is tougher. This is truly the most comprehensive, factual, helpful and demystifying treatment of the subject ever written. Thanks for a job well done! Very informative. I will be adding this to my Pinterest site for others to enjoy. I got some steaks called Club Sirloin Fillets from Guaranteed Foods. Where do these fit in as Type and Quality of steak? Thank you.